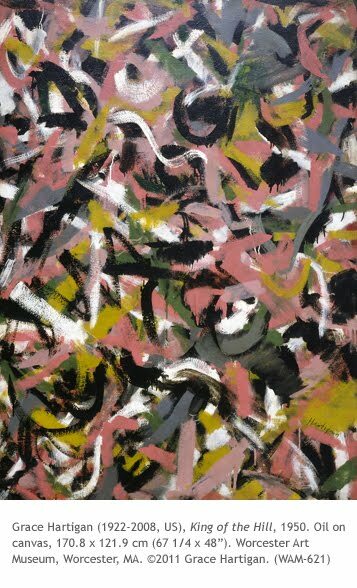 Inspiring Art Teachers to Explore Art History | Curator’s Corner: European Abstract Expressionism? What we generally read in art history texts is that during World War II (1939-1945) many European modernist artists fled to the US and ended up in New York. At the same time, many American artists with modernist tendencies felt that American art (then dominated by Social Realism) should express a new direction in modernism, divorced from the sterile geometric (De Stijl, Constructivism, Cubism) and non-subjective tendencies in European avant-garde art. What emerged was a synthesis of process and emotion. Bingo: Abstract Expressionism. Most art history texts also indicate that with the advent of Abstract Expressionism, the shift of focus on developments in modern art was to New York instead of Paris. Well, surprise, modernism in Europe didn’t just roll over because of Jackson Pollock and Willem de Kooning. It was alive and well, reacting to the same impulses within the New York School. The New York artists built on the European idea of personally invested abstraction, while avoiding the idea of rational composition. After the war European artists were also eager to move beyond the between war period (1918–1939) where preconceptions of control dominated avant-garde art. One of the veins of abstraction of the post-war period in Europe earned many stylistic terms, including Art Informel in France in 1950, meaning “formless art.” This was followed by such terms as Tâchisme (meaning blotted or stained) in the 1950s, referring specifically to French gestural painting. In essence, Art Informel / Tâchisme were the European manifestations of what spawned Abstract Expressionism in the US. 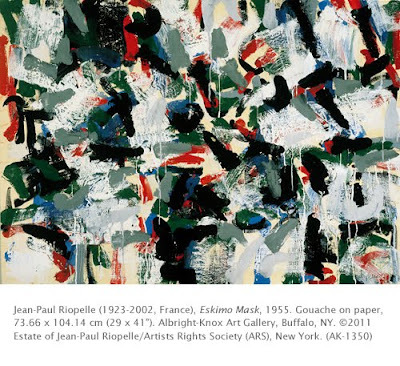 Jean-Paul Riopelle, born and educated in Montréal, moved to Paris in 1947. He became a follower of Georges Mathieu (born 1921), who has been described as the leader of Art Informel. Mathieu’s technique consisted of impulsive, gestural painting, often from squeezing paint directly from the tube. 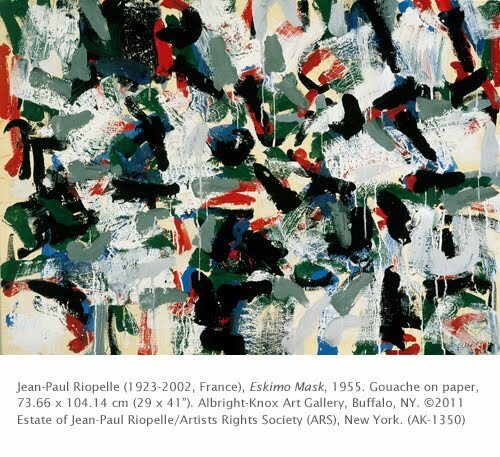 Between 1955 and 1979 Riopelle was the companion of American Abstract Expressionist Joan Mitchell (1926–1992), some of whose work his resembles. His main technique was to squeeze paint from the tube and shape it with a palette knife, often with directional lines of force. Like the American Abstract Expressionists, his work was intuitive and spontaneous, all the while documenting a process of creation. I t hink this work compares very interestingly to Mitchell’s, but also Grace Hartigan’s early work. Learn more about this painting and the artist in my post about Hartigan.